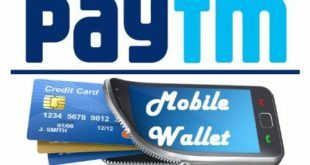 Home / E-Wallet / Paytm / How to Transfer Money from Paytm Wallet to Another Paytm Account ? 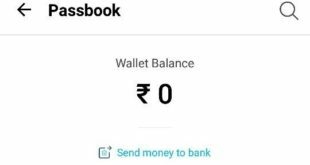 Transfer Money from Paytm Wallet to Another Paytm Account : Paytm is a popular electronic payment company in India which has its head office at Delhi NCR. Started in 2010, it has made a strong presence since then. Paytm Wallet is undoubtedly the most used e-Wallet these days in India. 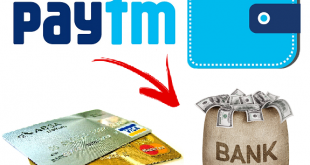 If you are looking to transfer money from Paytm Wallet to Another Paytm Account, this article will help you to do so. 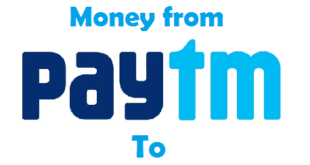 In this Article, we will tell you the step by step procedure to transfer money from Paytm to Paytm. Before we tell you about the procedure to transfer Money from one Paytm Wallet to Another, let us tell you what actually is paytm. What is Paytm Wallet ? 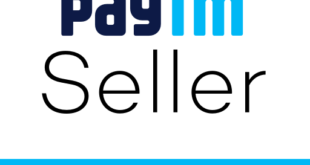 Paytm is a widely popular electronic payment company in India providing its services via browser, and mobile app on all well known OS including Android, Windows and iOS. By using the services of Paytm, you can do mobile recharge, buy movie tickets at Select Multiplexes, and make payments for your DTH, broadband, book flight tickets and taxis, electricity bills and a lot more. Paytm Wallet money is also accepted by a lot of Petrol Pumps across India. 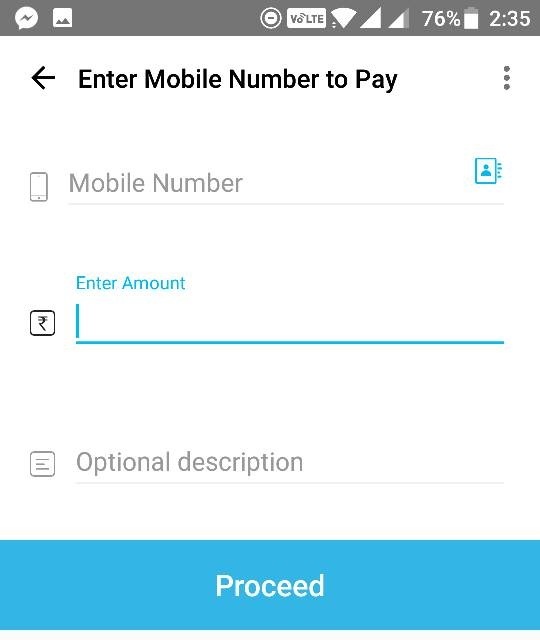 Let us tell you the procedure to transfer Paytm Wallet Money to Another Paytm Account through Paytm Mobile App. Also Read : How to Transfer Money from Paytm Wallet to Bank Account ? 1) Download the Paytm App on your Smartphone. 2) Open the Paytm App using your Login ID and Password. 3) Click on Pay to proceed to pay using Paytm App. 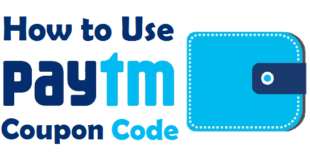 Point at Paytm QR Code to Pay. 5) In the next screen, you will see the Mobile Number already entered. After that you need to enter the Amount and an Optional Description. Click on Proceed to Continue. 6) Finally, you will be taken to the Payment Gateway where you need to make the payment. After making the payment, you will find the transaction receipt as shown below. 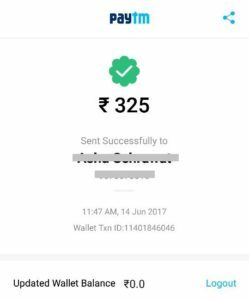 You might have noticed that the procedure to transfer money from one Paytm Wallet to Another is quite easy and can be completed within a few minutes only. Paytm App is quite user friendly and thus it makes it very easy for anyone to do any type of transactions easily. 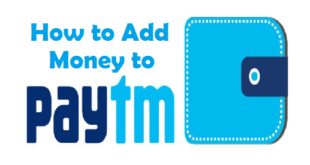 Previous How to Transfer Paytm Wallet Money to Bank Account ? 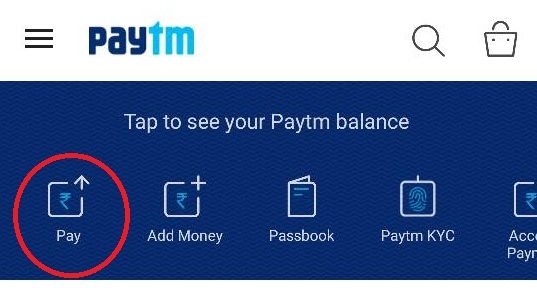 Next How to check Paytm Balance ?